Create a distinguished look on your curb with the Whitehall French Bronze Superior Personalized Mailbox Package. This fantastic package includes a deluxe personalized mailbox, a superior mailbox post with cap, and decorative brackets. The deluxe mailbox is made from die cast, rust-free aluminum and is powder coated in a deep bronze color with a weather resistant finish. Perfect for several days of mail and small packages, the box is 20% larger than most mail receptacles. Its durable mounting and hinge hardware are protected from the elements, and the magnetic door closure will last a lifetime. Included in this Superior Package are two side panels, to easily personalize the piece. Each side panel can hold up to five 4.5" characters as a one line version, or up to five 3" characters on the top line and up to sixteen 1.25" characters on the bottom line, for a dual-lined version. The gold color of the characters offsets the bronze background, ensuring your data remain visible. 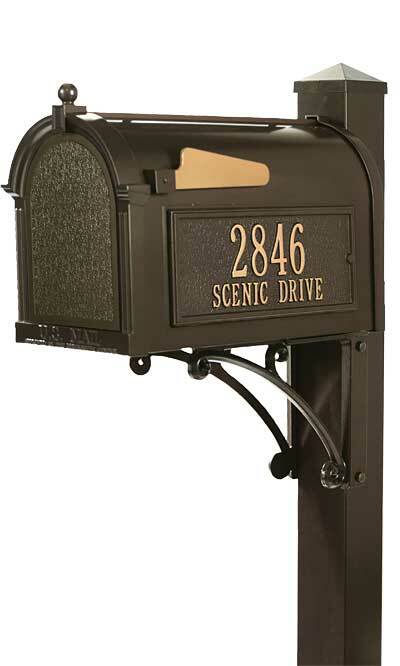 Easily add curb appeal to your home with the French Bronze Superior Personalized Mailbox Package.